The first cover shown below is very interesting. It has a GREEN printed cachet with a "clear" background. It is certain that Beck did not print this green cachet. The cancellation is the hand cancel and is discussed on page 23 in Ray E. Cartier's book Primary Recovery Ship Cover Handbook, 1993, 1998. In his book, Cartier shows a similar thermo graphed cachet and states that the cachet shown is of unknown origin. He further states that the hand cancel is scarce. 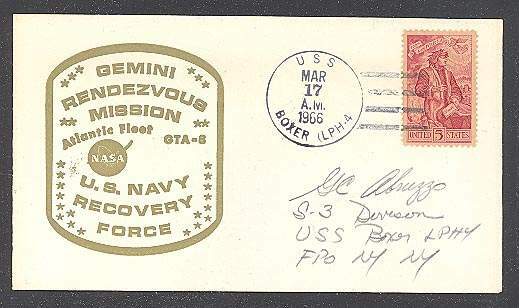 The first cover shown below is very interesting because it is addressed to CDR Tilton, HS-5 (Helicopter Anti-submarine Squadron Five). 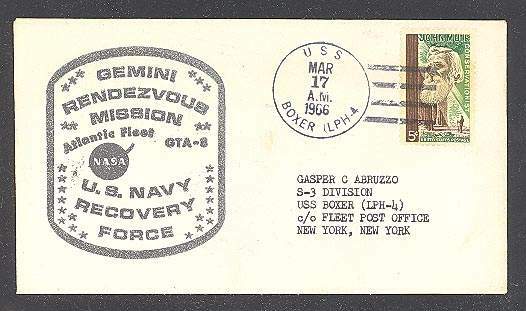 In our opinion, this clearly indicates that this cover is genuine and was indeed postmarked on the Boxer. 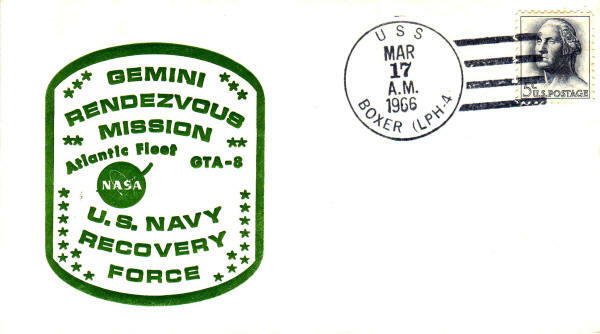 We believe that this is a CREW cover printed on board the ship. Note that the first two covers with green cachets have the same color green. The scans may not show the correct green color. They are the same color. "It is unknown how these covers were created but it is almost certain that Morris Beck had nothing to do with them. 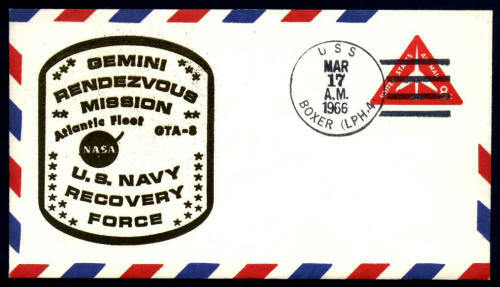 It is speculated that they were created aboard the USS Boxer using its printing facilities. 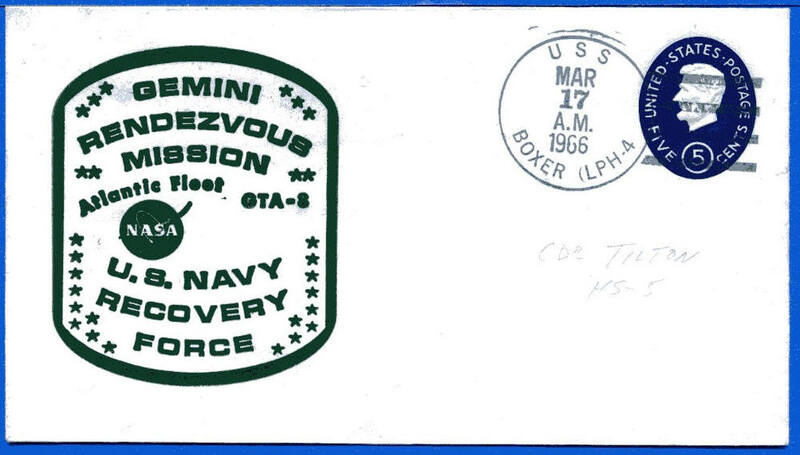 The fact that the gold, silver and green cachets have hand cancels and several were addressed to USS Boxer crew members are a strong indication they were created on board the ship. The status of the more common red cancel is quite different. It appears to be a rubber stamp cachet while the others are printed cachets and, in addition, it has only be found with a machine cancel rather than a hand cancel. That does suggest one possibility that it was created using the standard Navy rubber stamp using red ink rather than maroon ink. 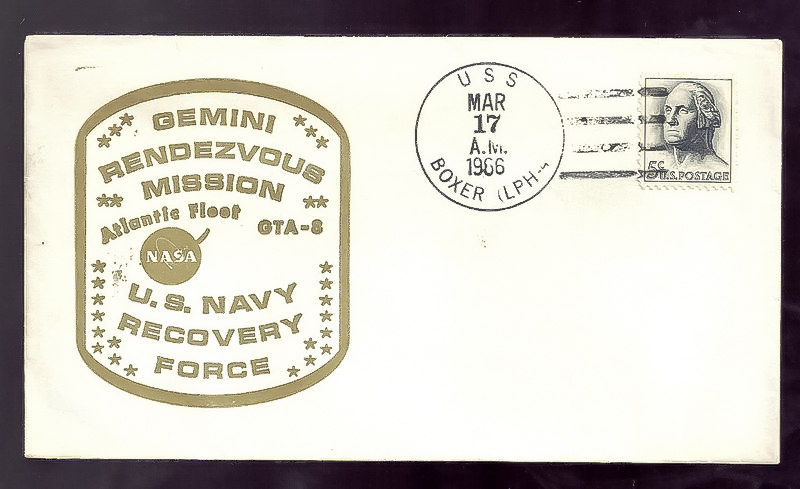 There is a precedent for the use of red ink with Gemini 2". 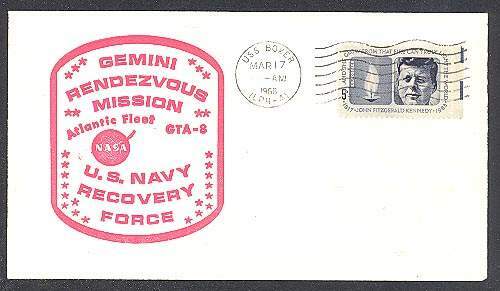 The following covers were offered on eBay in 2006 by Space Dealer Karl Hass. Note that these covers are addressed to members of the crew. In our opinion, these are genuine covers that were printed and cancelled on the USS Boxer. These covers also have the hand cancel which is seen less often than the machine cancel. 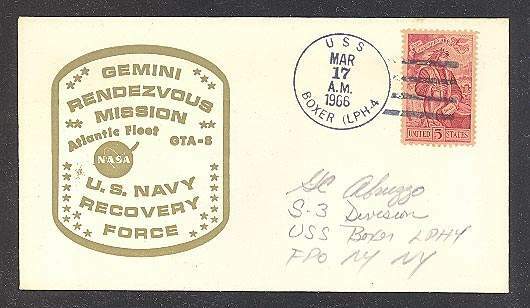 Note that the hand cancel shown on these covers has not been observed on a Beck printed cachet with or without the cachet number.